Amanda Newcomb at the Kuching affiliate office. 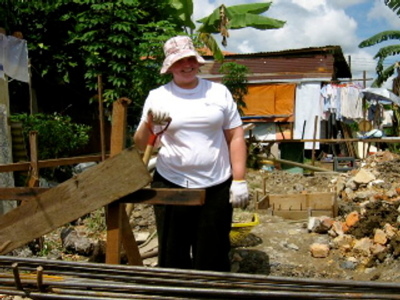 Amanda Newcomb didn’t know she would find herself in the wilds of Borneo towards the end of her 4-month internship with Habitat for Humanity (HfH) affiliate office in Singapore. 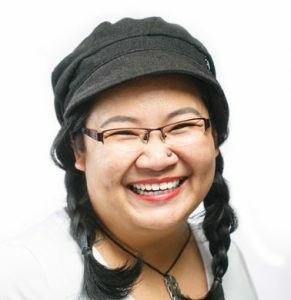 When the chance to go and work in Kuching came unexpectedly, she jumped at it. Newcomb admitted that it was hard to be in a strange country so far away from home. Her door out of the office and into the field came when she met Kuching-based attorney James Lo, who is very much involved with the local HfH efforts. “James suggested that I come over to Kuching to see what Habitat is doing there, get some experience in fieldwork, work closely with the selection process, and interact with the home partners.” she said. The 28-year old graduate student is close to finishing her masters in Social Studies at Boston College, but that was not what she originally signed up for. It was the moment when the big-hearted Newcomb knew what she wanted to do with her life. Her one week in Kuching proved to be an eye-opener. Being able to meet the people that the organisation is serving makes all the difference, and strengthens Newcomb’s sense of purpose. Seeing the actual living conditions of their potential home partners also hammered home how different life is for people living at the outer fringes of the low income group. 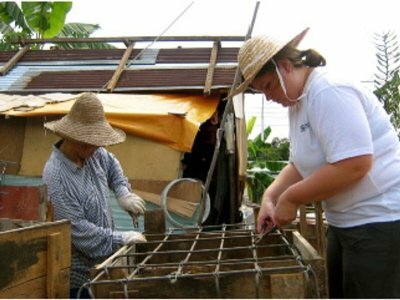 This international volunteer also saw for herself how important HfH is to the community, not just Kuching’s but on a worldwide level. Her days in the field found her under the hot sun somewhere in Taman Desa Wira together with architects from DNA, an award winning local firm, twisting wires to position steel reinforcement bars for concrete support posts. They were building a house for the family of Law Moi Nui. There is an interesting story behind this and Newcomb relates it to PostMag. Dapat Ajek’s family escaped with their lives, but lost everything in the fire. They were put up at the community hall, until HfH Kuching got in touch with him and offered their assistance. While Newcomb toiled under her farmer’s hat that day, Mrs. Law arrived and joined her at wire twisting duties. “She was much better at everything too!” Newcomb pointed out. But meeting and working with the home partner was the best part of the day. Since neither spoke the other person’s language, the trick and the joy was being able to communicate without using words. At some point, Newcomb mentioned the home partner’s sweat equity hours. She also pointed out that the new house is not a handout. For the low income group, repaying HfH is a more doable option to never being able to afford anything else, and never being able to climb out of the hole they are in. Newcomb is impressed with the Kuching affiliate and the people who make up the local HfH community. These volunteers band together to make sure Newcomb’s stay is informative and enjoyable – from helping her get immersed in the HfH work in Kuching, to making sure she gets out and experience Sarawak as well. “It’s nice to come here and see a new culture.” she said. from General Manager Gerald Goh. Home partners here are equally astounded to see the lone American among the volunteers. Although HfH is a Christian organisation, they make no distinction between race, religion and all the things some people like to draw their judgement on. Home partners are chosen based on their level of need, their willingness to be partners in the programme, and their ability to repay the no-interest loan. Volunteers come from all walks of life. Because HfH Kuching draws much of its manpower from volunteers, there will never be such a thing as “enough help today”. “The challenge is trying to raise awareness in Kuching about who we are and what we do.” Newcomb added. She hopes to see more companies investing some of their Corporate Social Responsibility time into the organisation. Newcomb feels that she gained a lot from visiting Kuching. As she heads back to graduate, she won’t forget everything she experienced here. In fact, she thinks that her fellow Social Studies students should look into paying Sarawak a visit. For more information on how you (and your company, church or school) can get involved with Habitat for Humanity, contact the Kuching affiliate at 082-242700. You can also visit the HfH blog or the online community to see how you can help. Originally published in The Borneo Post’s PostMag, 4 May 2008.
thanks for the plug, ‘gette! habitat for humanity kuching have some big plans in the works — including a song (singletrackmind, anyone?) and dance (hopefully a sneak peek at a locally made dance movie, sayang!) evening with none other than george-of-the-junk — stay tooned while we book kuching’s best and brightest…..
Pingback: KuchingBloggers.com » Do you want to build a house in 3 days? very interesting. i wish to do a 2-4 weeks humanity volunteer work..any suggestion?thank you! cili: You can visit the Habitat blog here for details on how to volunteer.